The 135th episode of THE FIRE AND WATER PODCAST is now available for your listening pleasure! THE FIRE AND WATER PODCAST is the official podcast of FIRESTORM FAN and THE AQUAMAN SHRINE. Shag is off this week (again! ), so Rob welcomes guest King-Size Comics Giant Size Fun host Kyle Benning to discuss four of Marvel’s 1970s books by Fireside Press: Origins of Marvel Comics, Son of Origins, Bring on the Bad Guys, and The Superhero Women! Face front, True Believer! You can find the 135th episode of THE FIRE AND WATER PODCAST on iTunes. While you’re there, please drop us a review on the iTunes page. Every comment helps! Alternatively, you may play the podcast using the player below or by right-clicking “download”, choosing “Save Target/Link As”, and selecting a location on your computer to save the file (50 MB). Since I couldn’t be on the episode, I just had to share the one Fireside book I own! Got brand new back in 1978. 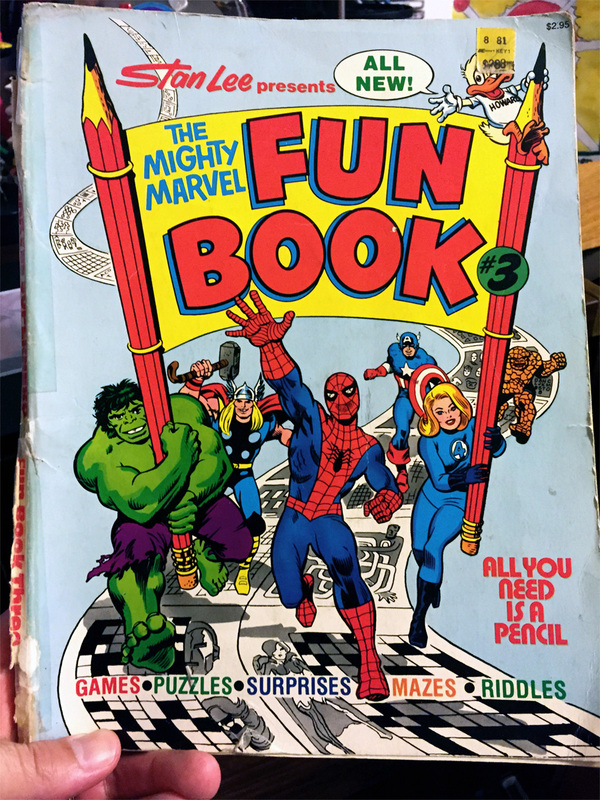 I spent countless hours coloring in this book and working out the puzzles! So much fun! Great episode, Kyle! I never had any of these Fireside Marvel books, but I always loved the covers to these four collections. Beautiful work! I never lucked into these books either, although those covers haunted me from ads of the time. I always coveted these and the DC reprint books. Great show guys! Thankfully, Waldenbooks and B. Dalton Booksellers were not as averse to trade paperbacks where nerd dollars were involved. The first trade paperback I ever owned, and the only Fireside Edition, was Captain America: Sentinel of Liberty, with its bright orange cover and painted figure. I was already interested in Cap, but seeing him judo throw a sumo wrestler and kick the Hulk in the face (as rendered by the likes of Kirby & Ditko) secured the Star-Spangled Avenger his place as an absolute favorite. While that book left my possession relatively soon via an abandoned/unpaid storage unit, I developed an early appreciation for the format. Trades held up better to rereading and loaning, plus I got a richer reading experience, so I was a trade-waiter before it was cool. Kyle asked me about Red Sonja on Twitter, and basically since she was created by Marvel and only very loosely related to Howard’s Red Sonya, she woulda-coulda been their copyright if they’d wanted to press the matter (and turned up in this Marvel book) but the rights ultimately went to the Howard spin-off company Red Sonja LLC. I bought a small press black & white Sonja book by Roy Thomas and Steve Lightle during the Marvel bankruptcy, so I wouldn’t be surprised if Thomas had some stake in the LLC as her creator. Sonja stories can take place in the Hyborian Age as a result of a settlement between the LLC and current Howard rights holder Paradox after they sued each other. During discovery, Paradox learned that their claim to the Red Sonya Howard story was very weak, so they agreed to leave Sonja alone and lease the setting to the LLC in exchange for the LLC not making waves and basically helping to prop up Paradox’s Sonya claim. I wonder if Fireside was a tongue-in-cheek name, given the mass book burning during the Wertham hysteria. This was such a great episode! I never even heard of the fireside books but Rob & Kyle presented it in a fun way. I am now looking on ebay for a cheap copy to read. BTW did Kyle ever win his ebay bids? No unfortunately I did not. It was an auction that ended really late at night and I ended up falling asleep and missing out! Wonderful episode, fellas! I cherished How to Draw Comics the Marvel Way all through my childhood. I’m going to wax nostalgic here for a second. I still remember my grandfather buying it for me at a convenient store near my grandparents’ house when I was visiting them one summer as a kid. I must have been around 8 or 9 years old, so the book had been out for at least 5 years or more at this time. He saw how excited I was when I discovered this book on the rack, so buying it for me must have made him just as happy as it made me. It was like an invite into the secret Marvel Comics club! I pored over it for years, reading and re-reading it any chance I got! I drew and re-drew images from the book, following Stan and John’s lessons to a “t”! Thankfully I still own it to this day and still enjoy flipping through for it a window into a different time in Marvel and comics history, and a window into my own childhood. Unfortunately I don’t believe I ever owned any of other Marvel Fireside books. The ones you discussed sound like a lot of fun. 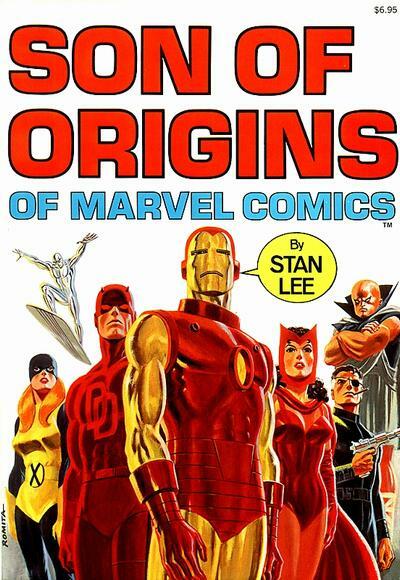 I’ve been hearing about Origin of Marvel Comics and Son of Origins for so long but I never seem to stumble upon on them at cons or in comics shops, dammit. And I’m with you, Rob with regards to Doctor Strange. I’ve liked him since I was a kid, and I think the fact that he was typically on the periphery and very mysterious was a big reason why. I’m amped for a Stephen Strange movie.